If you’re a shoe aficionado, you’re certainly aware of the investment – in both time and money – that designer shoes require. However, if you’ve recently purchased your first pair of designer shoes, you may be unaware of the extra steps that you should take to ensure that they remain in pristine condition. Sure, you could toss’em in your closet or let’em sit on a mat by the doorway but if you want them to last – and they are designed to last – there are a few measures that you can take to ensure that they have a long, happy life. In this post, we’re going to discuss how you can preserve and protect your favorite pair of designer leather shoes. Head on down to your local shoe repair shop, step up to the counter and ask for a good leather conditioner. At Corey’s Bootery, we carry a range of the industry’s best conditioners and, better yet, we can show you how to apply them to ensure the lasting durability and flexibility of your shoes. 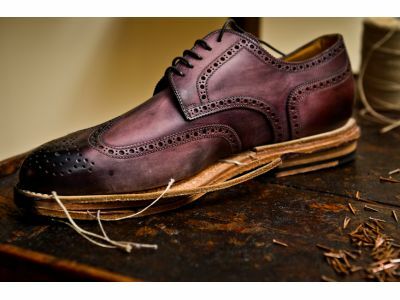 If your shoes have a rigid, strong shape – especially if they are leather – you should consider investing in shoe trees. Shoe trees don’t just maintain the shape of your shoes, they can help to prevent the accumulation of bacteria that may otherwise lead to unpleasant odors. At Corey’s Bootery, we want to help you keep your designer shoes in peak condition. Offering a range of Vibram soles, we can ensure that your shoes are prepared to withstand all that the elements have to throw at them. If you’ve been looking for a trusted, reputable shop to handle all of your shoe-related needs, be sure to visit our shoe repair shop today!